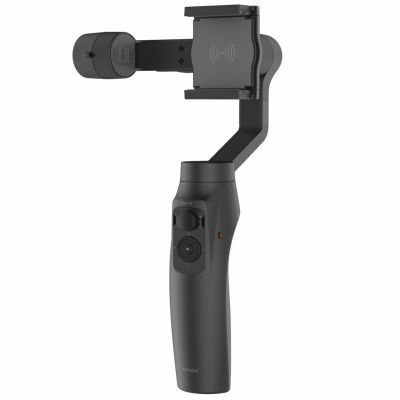 Keep your Apple iPhone or Samsung Phone fully charged with the MOZA Mini-MI Smartphone Gimbal. By using inductive charging technology and magnetic coils in the phone holder, the Mini-MI lets you charge your mobile phone wirelessly. Now you can enjoy the convenience of wireless charging and never stop filming. The 5V USB port on the bottom of the handgrip is compatible with all phone chargers and power banks, meaning you can have full control of your power supply. Not only that but the Mini-MI will charge while filming, putting all the power in your hands. You don't have induction charging? Smartphones without induction charging have the option to charge up with a 5V 2A USB port which is located on the pitch arm. The Mini-Mi features independent control system for each axis; Roll, Yaw, and Pitch. These axes can be controlled individually by 8 follow modes, giving you the same professional functionality that comes from MOZA's advanced control technology. Use one or all of the eight follow modes to capture smooth cinematic motion. Including the flexibility of manual positioning to give you more freedom to unleash your creativity! The Mini-MI's advanced MOZA App enables the built-in camera to create stable timelapse shots. Now you can shoot beautiful swirling stars, blooming flowers and spectacular sunrise or sunset with your phone. Want to stream smooth and steady video of live events to your friends? The Mini-MI enables you to stream smooth stabilized live video on Facebook, Youtube, Twitter, and Instagram. Allowing you to easily switch from landscape mode to portrait mode. By using the dial wheel located on the handgrip you can smoothly zoom in without touching your smartphone. The default mode of dial wheel is the zoom control. Simply roll the dial wheel clockwise or counterclockwise to zoom in and zoom out. The Mini-Mi enables you to dynamically control the focus on your phone so you can capture the magic of special moments. To select focus control, use the MOZA App and select it under the camera settings menu. • 4 accessory mounts to add Microphone, tripod, lighting etc. • Camera in APP to do shooting, recording and change IOS, white balance, RGB, EV value etc.